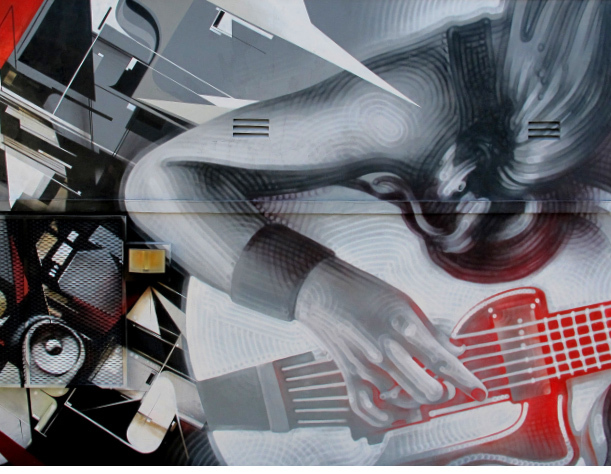 El Mac and Kofie are geniuses. Not because they have anything to do with KROQ but because they take otherwise mundane surfaces and transform them into works of beauty. Mac, as his friends call him, is tall, thin and completely unassuming. If you were standing next to him in a crowd you’d be clueless of the mountains of cred he’s amassed over his many years of creating public art. The son of a painter, Mac never thought he’d be painting monstrous murals on trains or dressing corporate art installations… It all happened without a plan. He loved painting and fortunately, he was good at it. It didn’t take long before he jettisoned his home turf of New Mexico to head for Los Angeles, the capital of West Coast graffiti. Graffiti is just like any niche. You’re either in the know or you’re not. Both fans of painters, and painters themselves typically have an artist or two they follow closely. El Mac is no different. I should have taken notes when chatting over a couple tacos. I was have been able to tell you which artists he’s fond of. But I’m lame and not much of a reporter. What was clear though, is that he’s a fan of quite a few artists working today. More importantly, he’s acutely aware of artistic style. 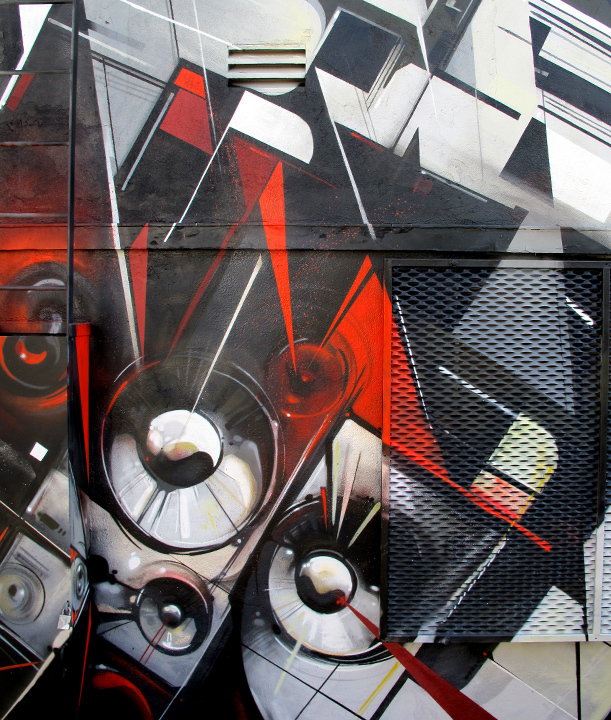 He credits all those that have blazed a trail for him to follow… the Graffiti legends. And, in my opinion, he’ll remembered along with a handful of greats. Kofie’s from LA. He eats, sleeps and breaths the City of Angels. He knows every street, every corner, every blank wall in the City. Skilled in architectural design, he plans and executes each piece with amazing precision. Today’s artists that rise to the top are smart and have a unique voice. When we see their work, we’re hearing their voice. Those that just see the dried color from an aerosol can are sadly missing the point. Kofie knows this and makes each piece grab your attention with hard lines and bold shapes that take your eyes on a journey… and he’s the tour guide. Together, El Mac and Kofie are a strong team. Mac’s flowing curves and gentle touch combined with Kofie’s ultra hard edges and bold colors make an incredible collaboration. 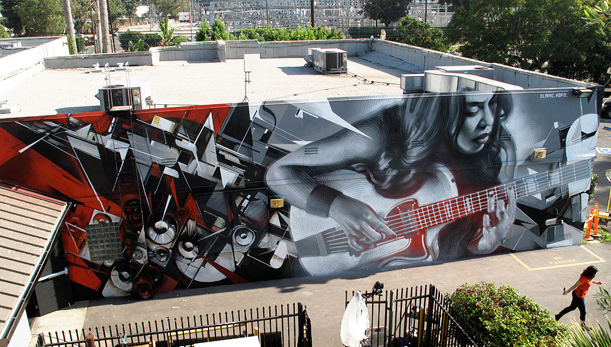 Tucked behind KROQ is the entrance to the Red Bull Sound Space. Just a few weeks ago it was an ugly door only the maintenance crews used for hauling equipment in and out. 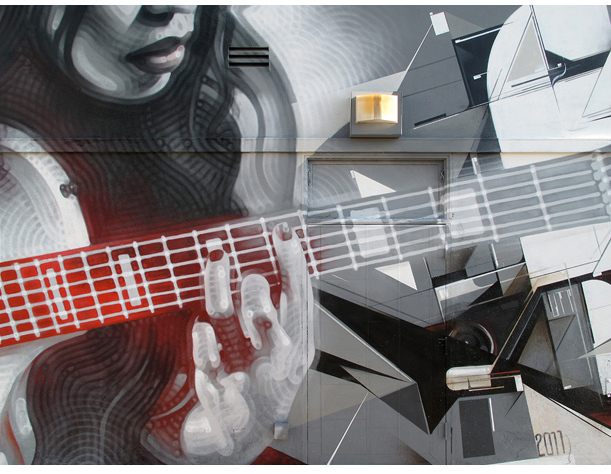 With the help of Red Bull, we were able to secure El Mac and Kofie to transform the 53′ wall into an entry way fitting for one of the coolest sound stages in LA, The Red Bull Sound Space at KROQ.